Jaguar's C-X75 range-extended electric supercar concept made its North American Debut at this year's 2010 Los Angeles Auto Show. The C-X75, designed to celebrate 75 years of the marque, is a 205 mph four-wheel drive supercar capable of running in purely electric (zero tailpipe emissions) mode for 68 miles on a six-hour domestic plug-in charge. The lightweight micro gas-turbines are also capable of very quickly and efficiently recharging the Lithium-ion batteries, giving the car a theoretical range of 560 miles. Subaru unveiled the Impreza Design Concept at the LA Auto Show, which previews their new "Confidence in Motion" design and brand strategy. The front view previews a new direction for the brand's design, with the hood, grille and headlights designed to project three-dimensional character. The combination of the 2.0-liter naturally aspirated Boxer engine with a Lineartronic™ Continuously Variable Transmission (CVT) represents Subaru's next-generation powertrain. 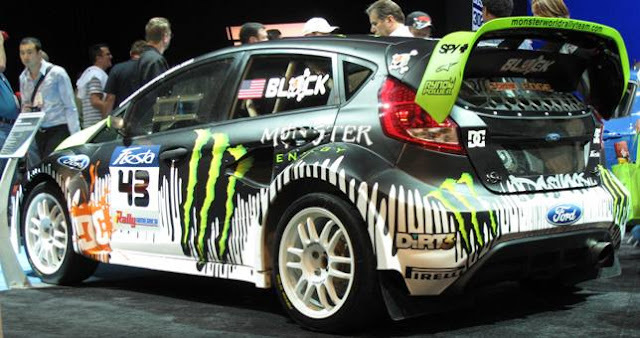 A 2.5-liter version of this engine powers the 2011 Forester. Subaru's advanced driving-assist EyeSight system is installed along the front edge of the roof. The images the camera takes can be viewed on a monitor in the center of the gauge cluster. 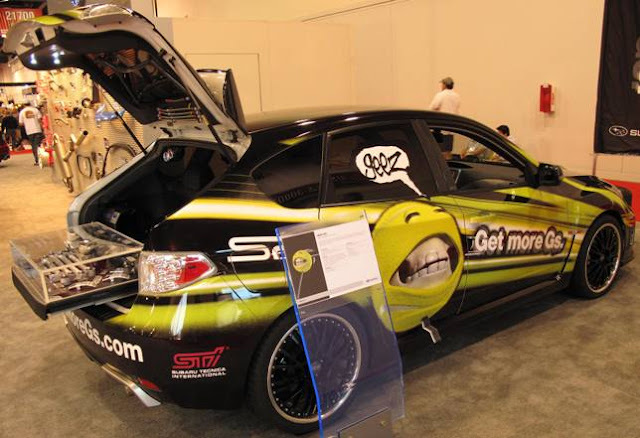 EyeSight is also networked with the latest in collision-prevention technology. I'm told this concept is expected to become reality. The 2012 MAZDA5 compact multi-activity vehicle will have a starting manufacturer's suggested retail price (MSRP) of $19,990, including destination and delivery. 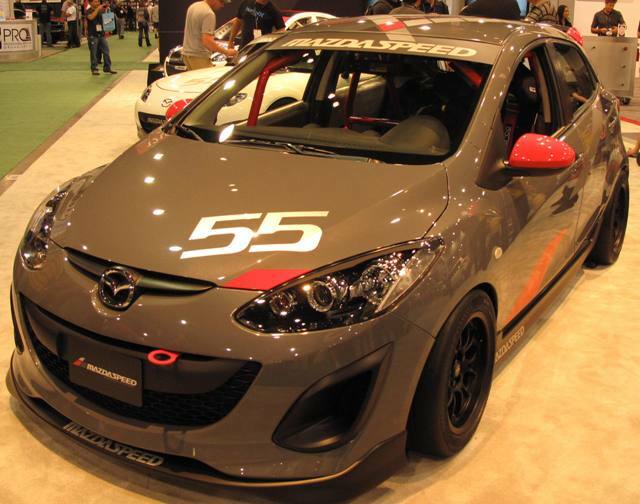 The 2012 MAZDA5 will go on sale at dealers across the U.S. in January 2011. 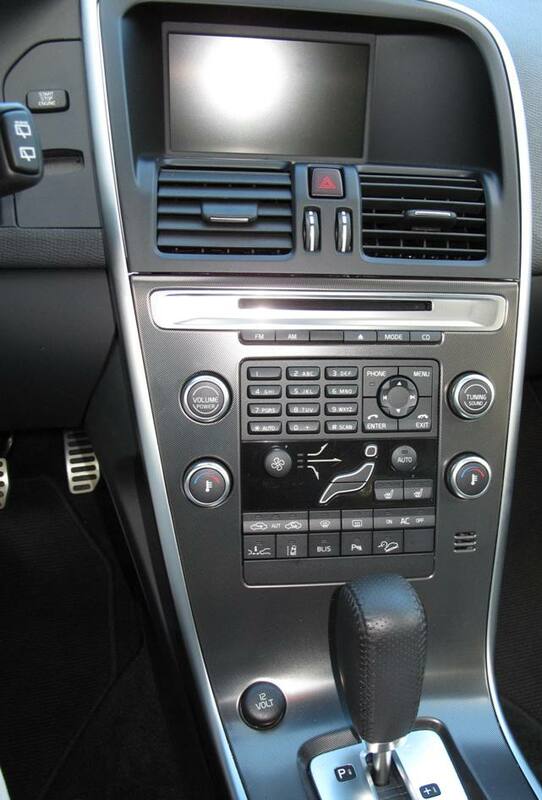 The 2012 MAZDA5 is powered by a 157 horsepower 2.5-liter MZR I-4 engine and can be paired with either a six-speed manual (Sport models only) or five-speed automatic transmission (standard on Touring and Grand Touring). 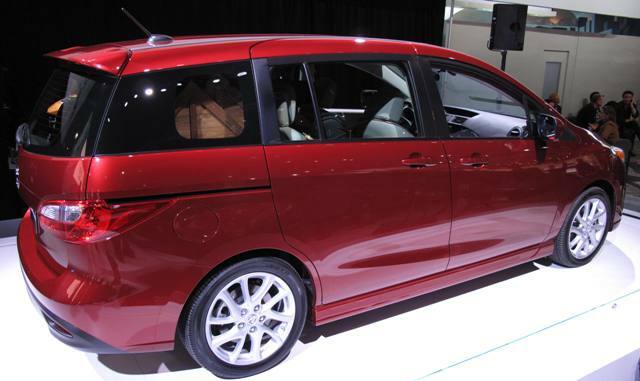 The 2012 MAZDA5 will be offered in three trim grades: the Sport, the mid-level Touring from $21,990 and the top-of-the-line Grand Touring from $24,670. The L.A. Auto Show media days had new debuts for everyone with a strong diverse exhibition of new vehicles with a couple of manufacturers wanting to blow us away. I'm talking about Dodge with six vehicles, their entire line-up, new or face-lifted - Challenger, Charger, Avenger, Durango, Journey and Grand Caravan. 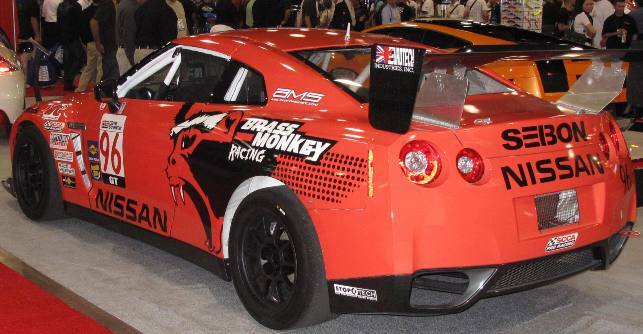 The other was Lotus with a debut of five hot sports cars. 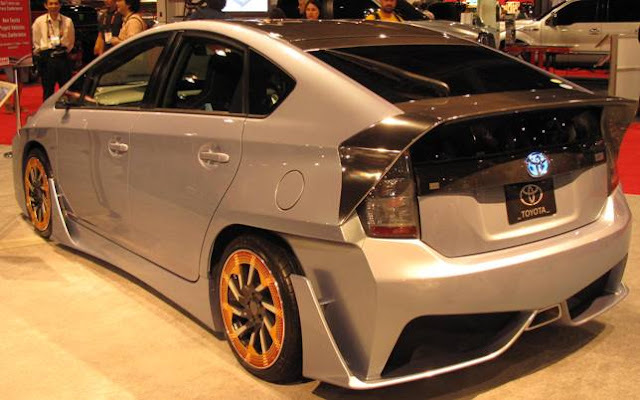 Electric vehicle introductions have been a theme of the L.A. Auto Show for years and this year we had the Honda Fit EV, Toyota Rav4 EV, Kia Optima Hybrid, Infinti's M35h, Buick LaCrosse e-assist and Mitsubishi's MiEV. The show stopper was the all-new Hyundai Elantra sedan starting at $14,830 and loaded with nav and rear camera monitor for under $20,000 - amazing! 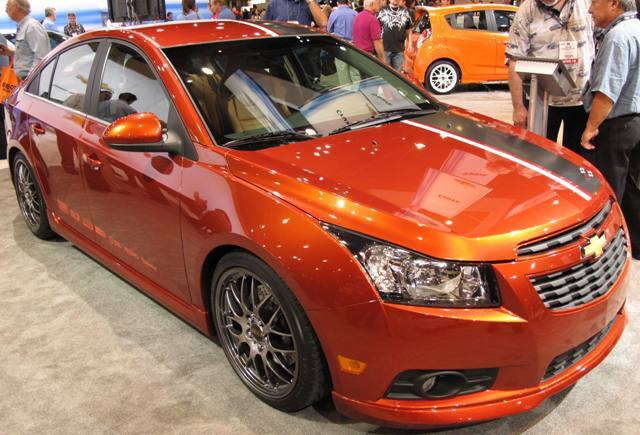 Another impressive mass market, high volume affordable sedan debut was the 2012 Ford Focus, coming in both 4-door and 5-door models. Chrysler showed off the new 200, replacing the Sebring sedan. Looking for a convertible? The Chevy Camaro, Volkswagen Eos and Nissan Murano CrossCabriolet debuted this week. New luxury choices include the Audi A7 hatchback sedan, Range Rover Evoque SUV, Saab 9-4X crossover and the Porsche Cayman R. Also, check out the BMW X3. If you're looking for a minivan the Dodge Grand Caravan, Chrysler Town & Country and Nissan Quest. 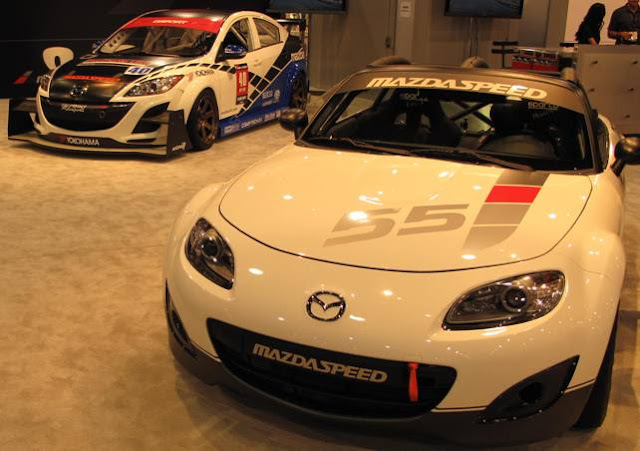 The hottest head-turning, eye-popping concept sports cars were from Mazda and Jaguar. Nissan showed the Ellure while Subaru says their concept reveals their design future. Also see the BMW 6-Series Coupe Concept. 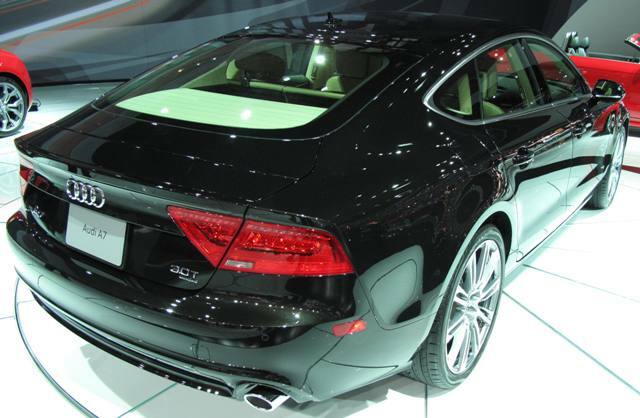 The L.A. Auto Show is open today through Sunday Nov. 28th and I'll have more on the new debuts over the next few weeks. 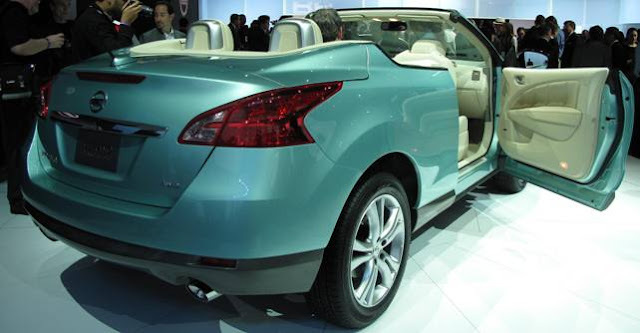 The 2011 Nissan Murano CrossCabriolet, the world’s first AWD crossover convertible was shown in an amazing color at the L.A. Auto Show and will certainly attract a buyer with expressive tastes with serious cash in the wallet with a starting MSRP of $46,390. This Murano is powered by Nissan's 3.5-liter 24-valve DOHC V6 producing 265 horsepower and 248 lb-ft of torque.It goes on sale early next year. 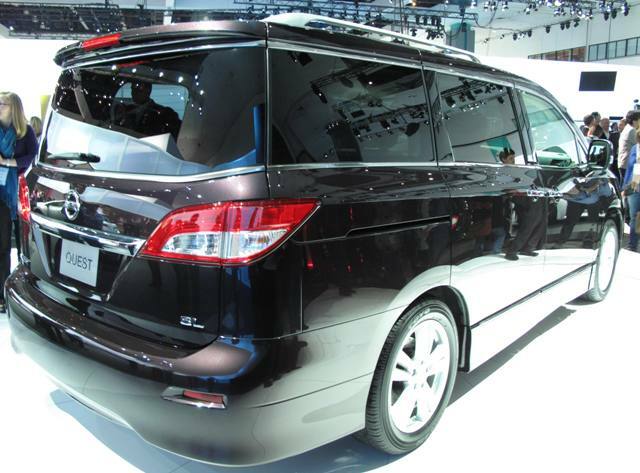 The 2011 Nissan Quest has a boxy look which is good for maximizing interior space and follows Nissan's "macho" design seen in their other vehicles. Quest standard features include quick release fold-flat 2nd and 3rd row seats, permanent hidden storage and Nissan Intelligent Key™. The 2011 Nissan Quest is offered in four models: S, SV, SL and LE – starting at $27,750. Porsche Cayman R is powered by a 330 horsepower 6-cylinder mid-engine mated to either a manual or PDK 7-speed automatic transmission. The manual starts at $66,300 and the auto at $69,960. 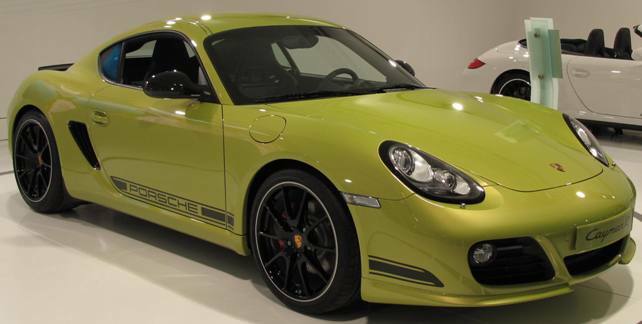 It's a poor man's 911 with many rich Porsche features. 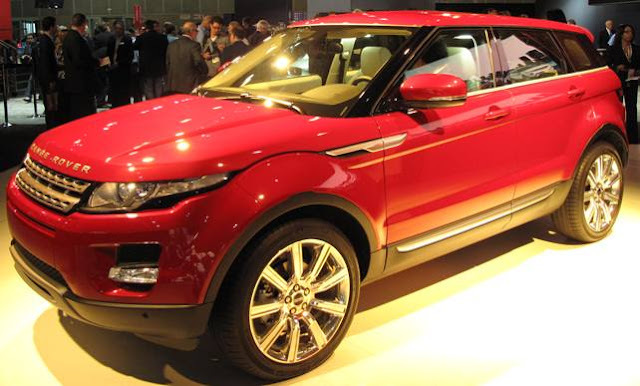 Range Rover Evoque 5-door, the smallest, lightest and most fuel-efficient Range Rover model ever, made its global debut at the LA Auto Show. The Evoque comes with a turbocharged 240 horsepower 2.0-liter Si4 engine. Range Rover Evoque is now available in two body styles, the Coupé and 5-door.Expect to see the Evoque in dealerships next year. 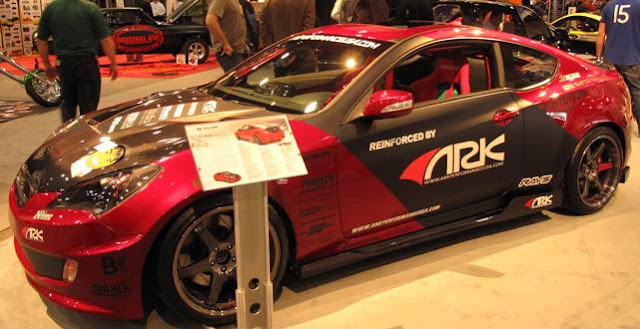 The 2011 Camaro Convertible, starting at $29,150, has a 312 horsepower Direct Injection V6 offering up to 29 MPG highway. The upscale SS has a 426 horsepower 6.2-liter V8 with an EPA-estimated 24 MPG highway. The available automatic transmission version of SS features Active Fuel Management and offers 25 MPG highway while delivering 400 horsepower. The Camaro comes in 4 trim levels: 1LT, 2LT, 1SS and 2SS and arrives in Chevrolet showrooms in February. 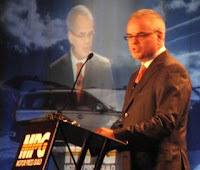 The MPG keynote speaker to kick off the 2010 Los Angeles Auto Show was Stefan Jacoby who, in August, was picked by Geely to run Volvo Car Corporation because of his success with Volkswagen in China. He attributed his move from President of VW of America to Volvo as liking challenges in the automotive industry believing he's the right man for Volvo's expected growth. In his speech, Jacoby gave a history of Volvo contributions to the auto industry and explained the U.S. sales slide from a 2004 peak of 140,000 vehicles to less than half that this year as a result of the financial crisis and a negative currency environment saying that things can only get better. He cited Volvo's C70 convertible, XC60, C30 and S60 as Consumer Reports' recommended vehicles. Jacoby promised to bring more attractive products from a leaner, better, smarter faster Volvo targeting to take this year's global production of 380,000 to 800,000 by 2020. 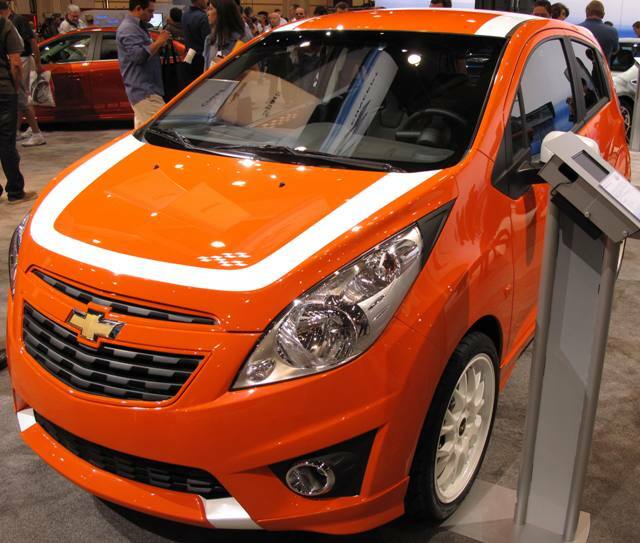 On the green side, Jacoby says their electric C30 with a 150km range will be in a test fleet in California next week. Volvo will build a factory in China where sales are up 50% this year over 2009. More details on the China plan and Geely's mission for Volvo will be coming in the next few weeks according to Jacoby so stay tuned. 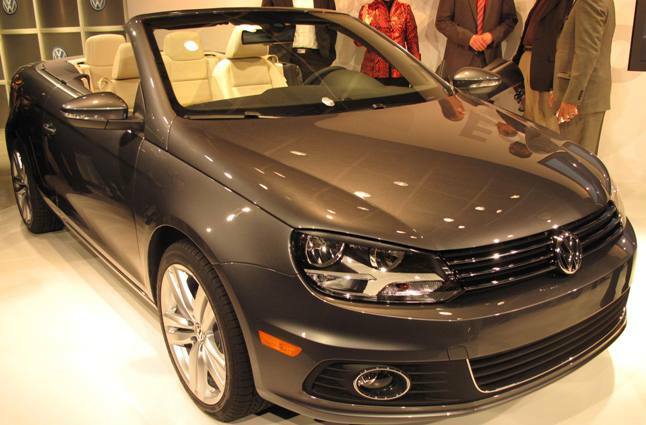 Volkswagen introduced their all-new "all-season" 2012 Eos hardtop convertible on the eve of the Los Angeles Auto Show to invited guests and celebrities at their design studio in Santa Monica. 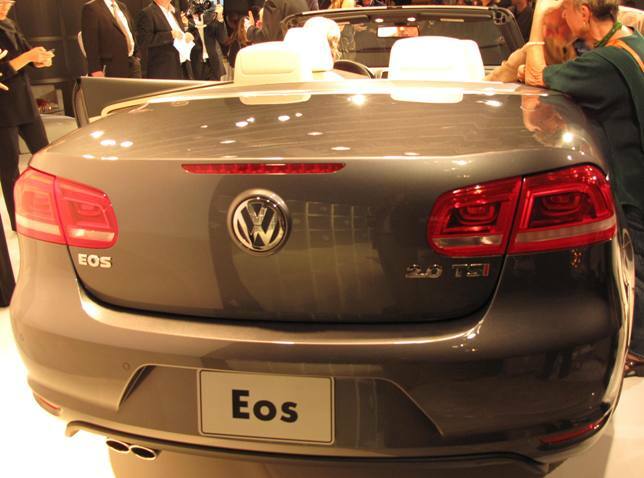 The Eos, in addition to being a full convertible, has a fully functional sunroof when the roof is up. The Eos comes with the 200 horsepower 2.0-liter 4 cylinder16-valve DOHC turbocharged engine delivering highway fuel economy of 31 miles-per-gallon. It's mated to a six-speed automatic dual-clutch system that engages and disengages gears without the need for a clutch pedal. The 2012 Eos hits the U.S. market in February and elsewhere in the Spring of next year and comes with the Carefree Maintenance Program covering the first 36,000 miles of scheduled maintenance at no charge. The Mullin Automotive Museum in Oxnard, California, open to the public on selected Saturdays, has some of the most rare cars on display, including Bugattis, Delages, Delahayes, Hispano Suizas, Talbot-Lagos and Voisins along with vintage racing cars and modern Bugatti prototypes. Peter Mullin took over the space once occupied by Otis Chandler's collection but none of the vehicles here now were part of Chandler's exhibit. 1936 Bugatti Type 57SC Atlantic, one of only 3 made, sold in May for between $30 million and $40 million to an anonymous buyer making it the highest price ever paid for an automobile. 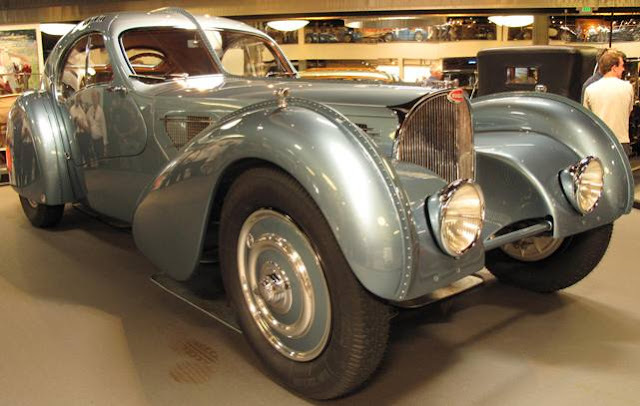 In 1971, this Bugatti was purchased for $59,000 by Dr. Peter Williamson who restored it. It won't be on display very much longer so get there to see it. 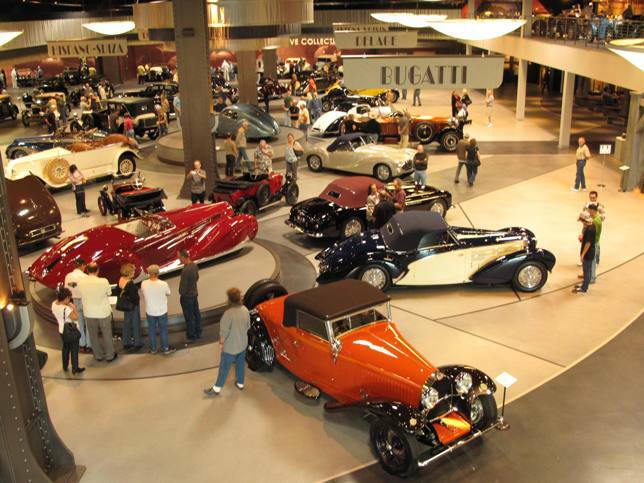 Visiting the museum is a rich cultural experience and an absolute must for any car connoisseur. General Motors October combined sales for Chevrolet, Buick, GMC and Cadillac was 183,392, an increase of 13 percent compared to October 2009. Year-to-date sales of 1,810,291 for GM’s four brands is an increase of 22 percent through October, while the industry has increased approximately 10 and a half percent. Ford Motor October sales of 157,935 was a 19 percent gain versus a year ago. 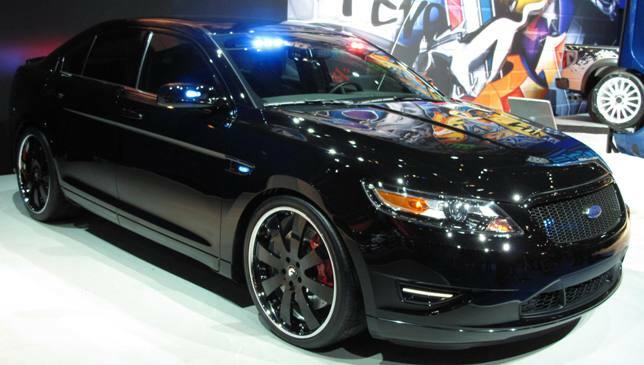 Year-to-date, Ford, Lincoln and Mercury sales totaled 1.6 million, up 21 percent. Ford is on track to gain market share for the second year in a row – a result not achieved since 1993. Toyota Motor Sales U.S.A. October sales of 145,474 units was a decrease of 0.9 percent from the same period last year, on a daily selling rate basis and on a raw volume basis, down 4.4 percent compared to the same period last year. Year-to-date Toyota sales are 1,456,790, a gain of 1.4 percent from 2009. American Honda posted October sales of 98,811 vehicles, an increase of 19.8 percent and year-to-date sales reached 1,011,247, an increase of 5.1 percent versus last year based on the daily selling rate. Chrysler Group reported U.S. sales of 90,137, a 37 percent increase compared with sales in October 2009. Year-to-date Chrysler sales are 910,357, up 17 percent from 2009. Nissan North America reported October U.S. sales of 69,773, an increase of 16.1 percent from a year earlier. Nissan Division sales were up 15.2 percent for the month, and sales of Infiniti vehicles rose 22.9 percent over a year before. For the calendar year to date, NNA sales are up 16.1 percent. Hyundai Motor America announced all-time record October sales of 42,656, up 38 percent versus 2009. For the year, Hyundai has reported total cumulative sales of 452,703, up 21 percent versus the same ten month period in 2009. Through October, Hyundai has already exceeded total and retail volumes for the entire 2009 calendar year. Kia Motors America announced sales of 31,199 vehicles in October, a 38.7-percent increase over the same period last year and an all-time sales record for the month of October. Kia's year-to-date sales are up 14.6 percent over 2009. Volkswagen of America sold 20,084 vehicle in October, a 17.9 percent gain from last year and year-to-date has sold 212,774, a 20.3 percent rise from the first 10 months of 2009. 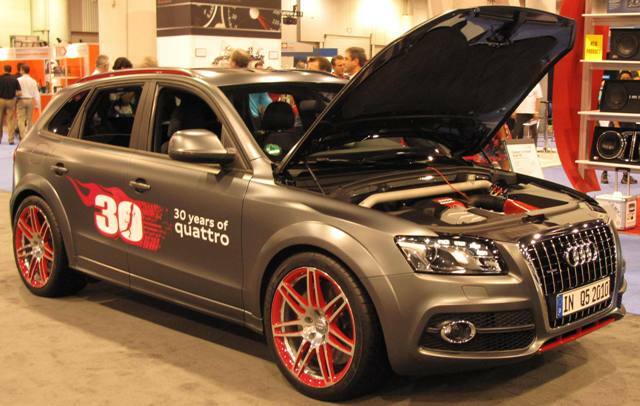 Separately, Audi sold 8,128 vehicles, a 10.5 percent increase over October 2009, surpassing the prior October record set in 2008 by 685 vehicles. 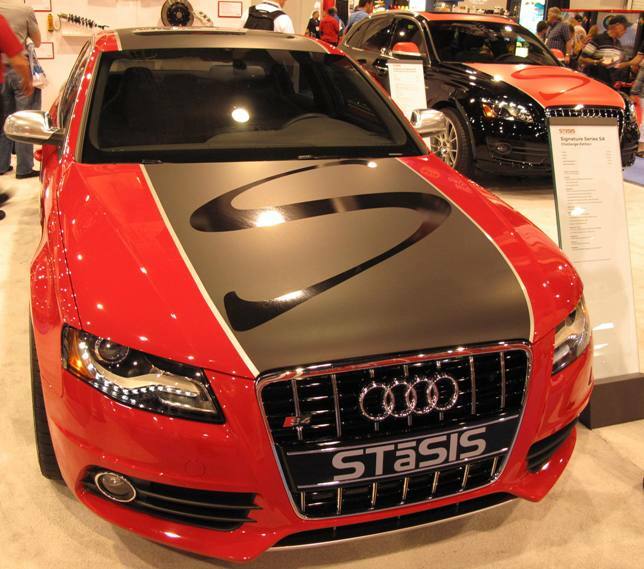 Year-to-date Audi sales are 81,718, a 22.2 percent increase over 2009. The BMW Group in the U.S. (BMW and MINI combined) reported October sales of 23,222 vehicles, an increase of 12.6 percent from October 2009. 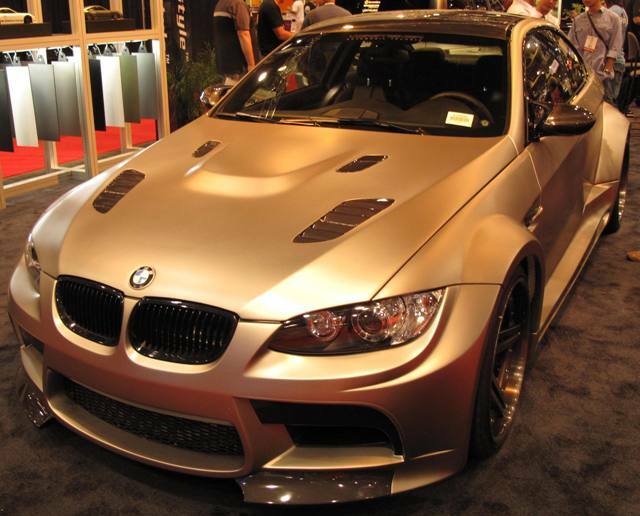 Year-to-date, the BMW Group reported sales volume of 215,274 vehicles, up 7.7 percent through October 2009. Subaru of America had its best-ever October with sales of 22,720 units, exceeding the previous "best-ever" result set in 2009 by over 25 percent. 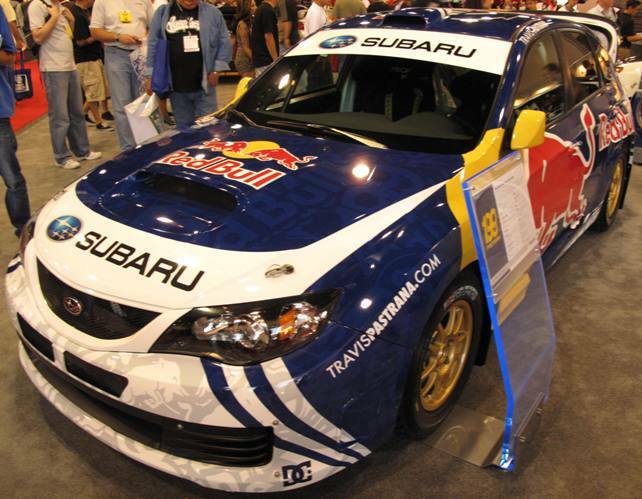 Subaru year-to-date sales now total 216,334 units – a 23 percent increase compared to last year. The October year-to-date result puts the brand within a few hundred sales of a new annual record. Daimler reported U.S. sales of 19,443 Mercedes-Benz and smart vehicles, an improvement of 3.1 percent compared to October 2009. Mercedes-Benz USA October sales of 19,076 vehicles was an increase of 4.9 percent for the month with 18,351 passenger cars, light truck vehicles and 725 Sprinter vans are included in this total. On a year-to-date basis, the company sold 184,431 new vehicles, an increase of 20.1 % over last year. Mazda North American Operations reported sales of 18,013 vehicles in October 2010, an increase of 19.5 percent over the same month last year. Year-to-date sales through October 2010 stand at 192,783, and are outpacing last year's sales by 10.0 percent. Mitsubishi Motors North America announced October sales of 5,111, an increase of more than 32 percent compared to October 2009. It was MMNA's fourth highest monthly total in two years. The 32 percent increase represents Mitsubishi's largest year-over-year percentage increase for a single month since July 2002. 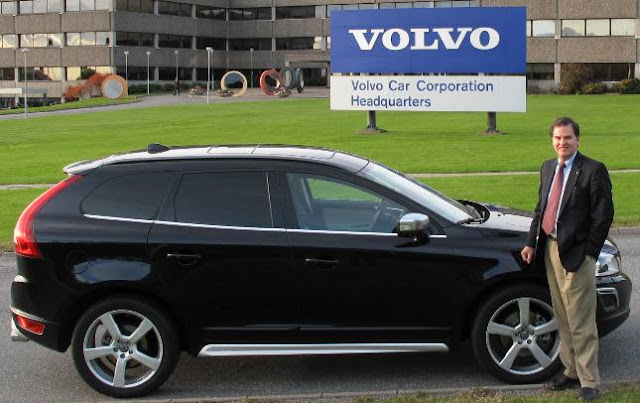 Volvo Cars of North America October U.S. sales were 3,996 units, a 9.9 percent decrease from October 2009. Year-to-date sales are 45,114, down 11.8 percent over the first ten months of 2010. American Suzuki sold 2,043 vehicles in October a 17 percent gain but year-to-date sales are 19,015, a 46 percent tumble from 2009. I fell in lust with the Volvo XC60 at the Geneva Auto Show in March of 2008 and fell in love with this one (pictured above) a few weeks ago in Sweden while driving the highways and streets around Gothenburg, the home of Volvo, which translates from Latin to "I Roll". The compact luxury SUV starts in the low-$30,000 in the U.S. and is a head turner while behind the wheel the smooth handling and polished interior appointments really grab you. Admittedly the 'R Design' model I test drove was loaded with Volvo's safety technology like the lane departure system, park assist rear camera and collision warning. At speeds over 20 mph, Adaptive Cruise Control can automatically maintain a safe distance from the car in front of you. Collision Warning with Auto Brake for highway driving warns you if you’re too close to the vehicle in front of you by illuminating a red light heads up display on the front windshield. 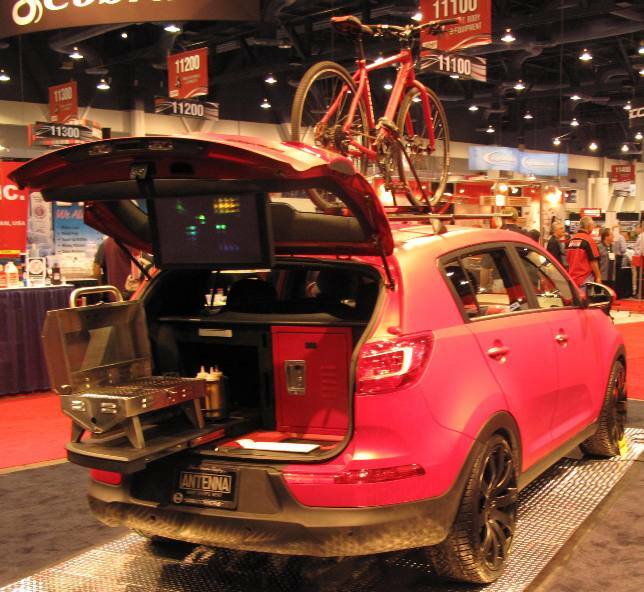 This XC60 had a power tailgate but not the navigation option which I really could have really used. I was told that even Swedes get lost in and around Gothenburg's confusing streets, not just visitors like myself. Maybe the sudden 1968 conversion from driving on left to the right may have played a role in the street layouts that have many round-a-bouts. So that old Volvo slogan, "Drive It Like You Hate It" came easy to me and the more I got lost and got mad at myself the more I liked the XC60. If you can spend all that extra unnecessary time driving around and still like the vehicle - it's a good sign. 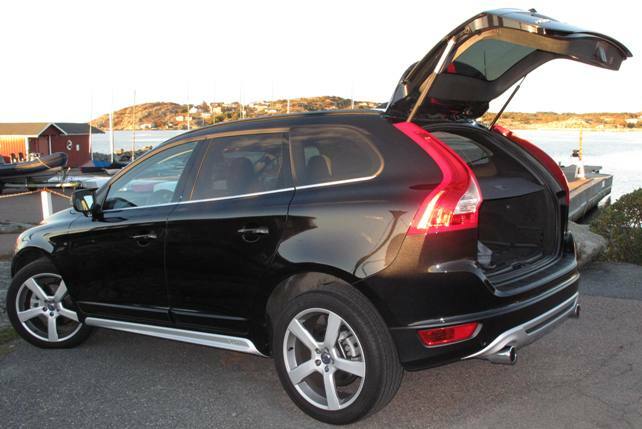 The XC60 is the most popular Volvo in the U.S., the largest market for the Swedish automaker. The XC60 is made at Volvo's plant in Ghent, Belgium. 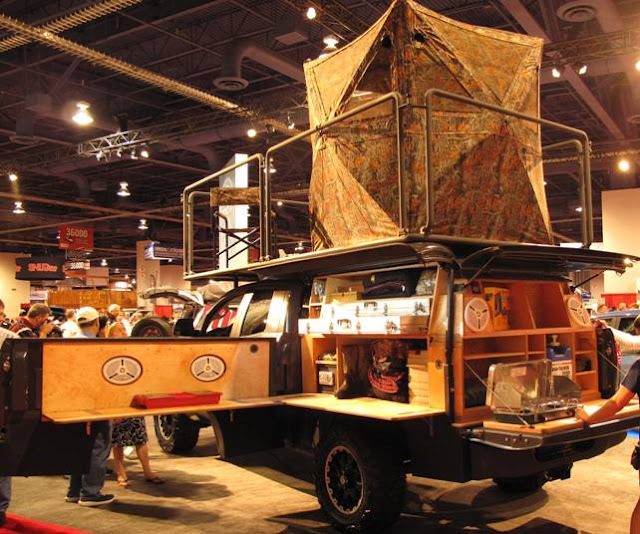 This diesel engine version was amazingly responsive and fuel efficient. If permitted, I would have taken this exact vehicle back to California but as yet no Volvo diesels are sold here. 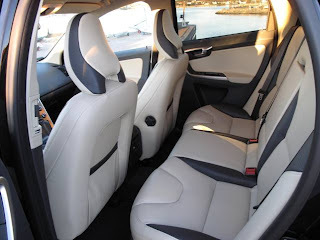 In the U.S., the Volvo XC60 has either a 281 horsepower 3.0 liter in-line six-cylinder engine with Twin-scroll turbo or a 235 horsepower 3.2-liter in-line six-cylinder engine. The sporty R-Design version has a stiffer chassis while inside there's a metal finish with aluminum inserts in the steering wheel, door moldings and in the center stack. The sports pedals are made of brushed aluminum, with rubber inserts. The factory tour had a number of people who were coming to pick up their new Volvo, apparently a significant saving over driving the vehicle off a dealer lot in the U.S. At the end my nearly 6 days of excursions on less than a tank of diesel, again if I could have, I would have taken this XC60 home with me! Volvo provided the vehicle for this review.